The title for the link in the menu structure can be edited here, if the setting Use title of application is deactivated. Every application which has been published to your portal can be selected here. 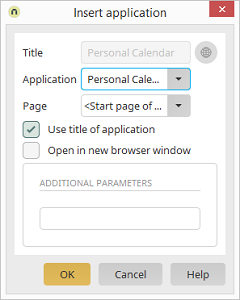 Select the page which should be opened when the user clicks on the application link in the menu structure in the browser. The application title is used as the title for the link in the menu structure. When the user clicks on the link in the menu structure, the application will open in a new window. As is the case with alternative start pages, additional parameters can be specified that will be added to the URL when the user clicks on the menu item.